The drama about a woman, Kim Hye Kyung (Jun Do Yun), who assumes responsibility for her family after her husband, Lee Tae Joon (Yoo Ji Tae), is thrown into prison after a very public scandal. Lee Tae Joon was a prosecutor with the Seoul Central District Prosecutor’s Office who gets sent to prison and whose wife is then propelled to return to her former career as a lawyer to support her family. 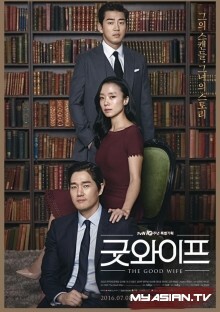 An excellent drama. I haven’t watched the American version, so I’m not going to compare it to the original. For me this was a good drama. The legal aspect were not that hard to understand, and it was a nice mix between the cases and the wife’s problem. I had one problem though. The lead actress’ acting were a little stiff in my opinion. Maybe the problem is Jeon Do Yeon's eyes, she didn't change her expression from start to finish of this drama, her eyes showed sadness, even when she's happy. Talking about acting, Yoo Ji Tae! Wow, if eyes could kill, even though he was a villain in this drama, I couldn't help but be on his side. Another actor that took me by surprise: Nana! I loved them all but those two were my favorites! All in all very satisfied with it.